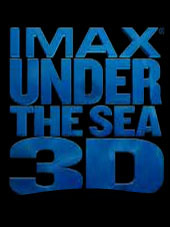 From director, writer and photographer Howard Hall comes Under the Sea 3D, a wonderful and informative IMAX documentary that takes viewer on an underwater journey of some of the world's most amazing sea creatures. Narrated by Jim Carrey, he successfully manages to capture the viewers imagination and although there is a touch a humour, Carrey ensures that this documentary is nothing more than professional. Filmed with the latest 3D photography techniques, Under the Sea showcases three distinct parts of the world that include Papua New Guinea, Indonesia, The Great Barrier Reef and the oceans of South Australia. Each of locales is quite diverse as are the creatures that inhabit these areas and Hall carefully moves between locations as the viewers experience turtles, sea snakes and dragons. There are two stars of this documentary, one is the amazing underwater creatures and the second, is the visually stunning 3D effects that almost makes you part of this documentary. The video quality is truly impressive with exceptional vibrant colours and an amazing rainbow colour palette, thanks to the wide variety of colourful fish. The documentary also gives the viewer a strong message, thanks to Carrey that mankind is destroying the habitats of these innocent creatures, from the coral destruction in The Great Barrier Reef to the warming of the seas in South Australia which is threatening the dragons and the seals. If the waters continue to warm, these creatures will have nowhere to call home. In conclusion, Under the Sea 3D is a colourful and amazing journey into this hidden environment which is nothing short of spectacular. Truly a movie that the entire family can enjoy and the unexpected yet clichéd ending will definitely draw your heart strings..